Bounty Island is a 48 acre tropical island that is the closest Mamanuca island to the mainland. The island itself includes tropical vegetation that is ringed by white, sandy beaches and then surrounded by the clear blue waters of the island's own marine park. This idealic setting makes Bounty Island ideal for relaxing, boating and swimming, as well as providing some of the best snorkeling opportunities in Fiji. The resort on Bounty Island offers all types of travellers affordable island accommodation that will suit any budget, making it ideal for couples, friends, groups and families. 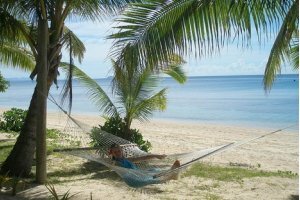 When you stay at the Bounty Island resort you can lay back and relax whilst watching the lap the shore of this tropical island paradise or you can make the most of the many water based activities that are on offer. Bounty Island is the closest island in the Mamanuca group to the main Fijian island of Viti Levu. Guests staying at the Bounty Island resort can make the most of the 'meet and greet' service from the Nadi International Airport to Vuda Marina and then travel by speed boat to the island in only 20 minutes. Alternatively they can take the South Sea Cruises ship from Denarau Marina which leaves 3 times a day at 9am, 12:15pm and 3:15pm. The Bounty Island Resort is one of the closest Mamanuca resorts to the Fijian mainland and provides cheap holiday accommodation on a beautiful tropical island. The Bounty Island Resort has lots of fre activities for guests including a fresh water swimming pool, fish feeding, canoes, kayaks, cultural lessons, bush walks, volleyball, table tennis and even a pool table. This island resort in ideal for couples and families who are travelling on a budget and the surrounding coral reefs provides some of the best snorkelling in the Mamanuca Islands. If you want hotel and/or resort accommodation on Bounty Island at cheap rates for your next holiday then Holidays Fiji is the place for you. We give holiday travellers the ability to compare a range of hotels, resorts and apartments at the same time, thus making it easier for you to decide where it is that you want to stay. So book your accommodation at any of the Bounty Island resorts with confidence, and even take advantage of the cheaper rates for longer stays.